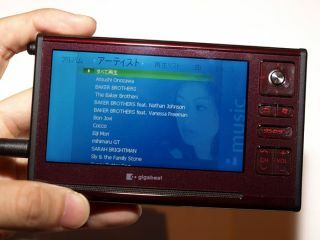 We've already seen this week how far Microsoft has to go to meet its sales targets for the Zune PMP. And it's painfully clear that the product line is in need of a revamp soon before it falls too far behind the Great White market leader. This pressing need has led many to wonder if the latest Gigabeat from Toshiba Japan might actually be the next generation of player from Redmond. Admittedly, it's unlikely that Microsoft will go for anything as large as the new V series Zunes, but stranger things have happened. The two new players are both hard drive models, with the V401 costing ¥49,800 (£207) for 40GB and the V801 ¥59,800 (£248) for 80GB. Each weighs around a quarter of a kilogram, give or take a few grams, which means buyers will need to really want the features on offer. Foremost among these is a huge 4-inch screen that displays video very nicely across 480 x 272 pixels. Toshiba claims each player can manage 10 hours of video and 28 hours of audio playback on a full charge. Switch on the 1-seg digital terrestrial TV tuner and you'll get 8 hours of goggle-boxing. Naturally, both models can record those satellite broadcasts on schedule and output them to a TV later. So the 390 hours of programming the larger Gigabeat can lay down may well clinch the deal for Japanese TV addicts. Let's hope an equivalent tuner is included in the overseas models however and whenever they arrive.